When measuring at high sample rates, a long record length/large memory is necessary to be able to record a complete signal in the acquisition buffer. Where most oscilloscopes have 2.5 kSamples or 100 kSamples memory, the Handyscope HS6 DIFF has up to 256 MSamples memory per channel, depending on the selected resolution and the number of active channels. When measuring at 14 bit resolution and all four channels, the available memory is 32 MSamples per channel. This gives the user 300 to 100000 times more memory. An advantage of a large memory is that once-only fast phenomena can be captured accurately or complete serial communication signal blocks can be measured all at once. For example complete serial communications, like CAN bus signals, can be measured all in one record to be reviewed and analyzed afterwards. The unlimited super zoom feature of the Handyscope HS6 DIFF allows to zoom in to individual samples, no matter what record length is used. Figure 1 shows the same signal three times with different zooming factors. The lowest graph shows just 256 ns of the total 256 ms, a zoom factor of 1 million and still provides enough detail for accurate signal analysis. 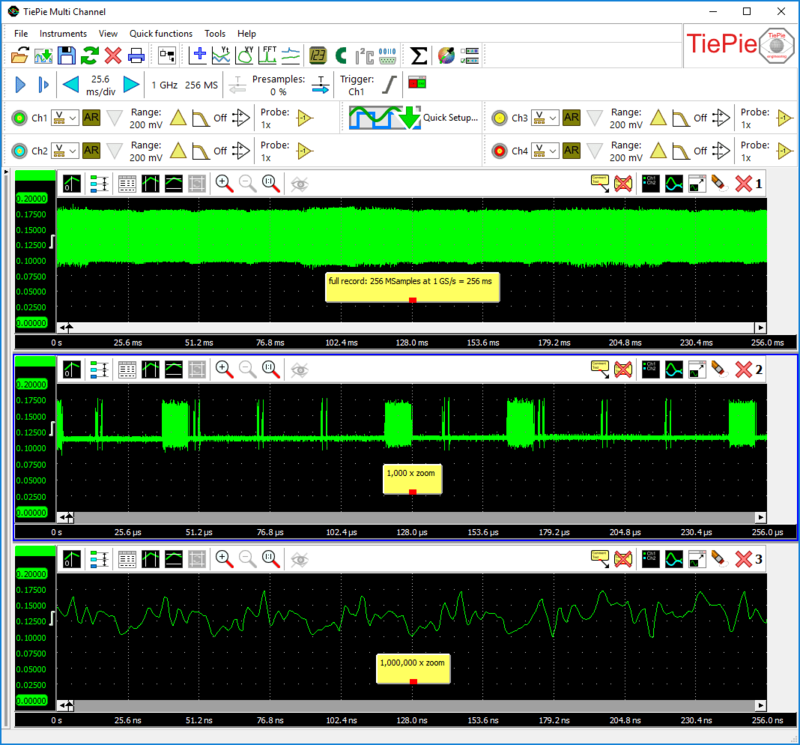 Hint: Record lengths larger than 32 MSamples are only available in the 64 bit version of the Multi Channel oscilloscope software.